Our client James Hazlerig has used our SEO advice to help HypnosisAustin.com rise in search results. Paid placement on the first page of Google search results takes almost no effort at all, aside supplying the search giant with a pile of cash (in the case of some keywords, quite a hefty pile.) “Organic” search engine traffic, like an organic apple, takes a little more effort to grow. But the results can be far more satisfying and delicious. Today we heard from a client about the pleasant surprises that can come from following our search engine optimization advice. At Imagine That Creative, it’s our policy to never talk about ourselves. Especially when our happy clients do a far better job of it than we do! 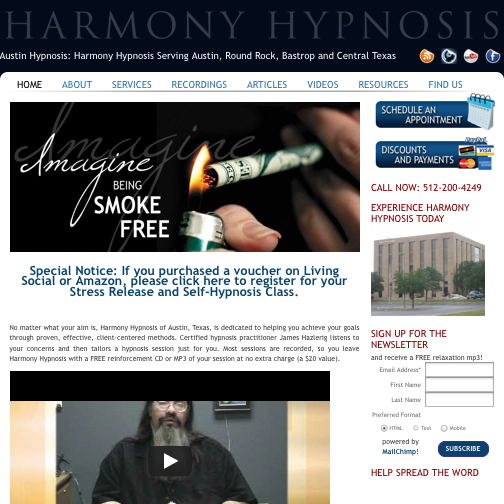 Our client James Hazlerig is a consulting hypnotist in Austin, Texas, who helps people lose weight, stop smoking, and do a better (and more enjoyable) job of living life. About a year ago, James launched a new website and a couple of new landing pages to help him attract more smoking cessation business. I’ve been following Kathleen’s SEO advice for about six months, which has resulted in excellent Google results for my site. Last week, I received two calls from new clients who had been given my number by their doctors–whom I’d never met! The only way they could have found me is through a web search, and thanks to Kathleen Hanover, my site came up first. If you’d like to discover how your online content can start getting the love from Google, drop us a note!